Growing up in the church, the alter or mercy seat as our church called it, was prevalent in all church's. 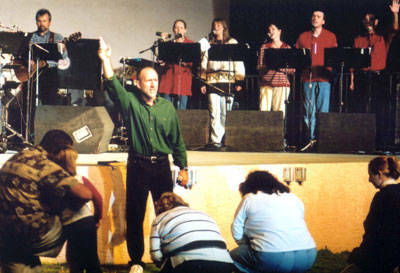 And, I can remember the alter being filled with my preacher Daddy walking back and forth, in front of the alter, singing encouraging chorus, one after another, while all the people prayed through, as we would call it. Yes, prayer is the work of the church and it all starts with the bended knee. Those were certainly "good old days" as the "Spirit Filled" the church services. So, what has happened? Where are all the alters, in our modern day church sanctuaries? I guess one need only to stand up in front of the church, now-a-days, and shake the preachers hand to be saved. I'm not questioning the validity of such a maneuver, I just feel there's something special about kneeling before the Lord, in prayer, at an old fashion alter. It gives a testimony to others, but most importantly, it shows reverence to our Heavenly Father.